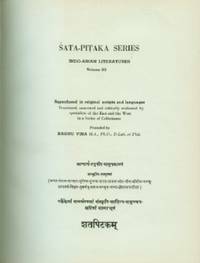 New Delhi: International Academy of Indian Culture, 1964 Fom the Sata-Pitaka Series, Indo-Asian Literatures, Volume 33, reproduced in original scripts and languages. Translated, annotated and critically evaluated by specialists of the East and the West in a Series of Collectanea. Part 1. Green cloth with gilt titling on spine, textured green end papers, 186 pages. Page edges slightly darkened, otherwise book is in great shape. Shipping charges are calculated for a standard parcel under 1 kg. Additional charges will apply for heavier shipments, but not until the customer agrees. Canadian customers, please note that applicable sales taxes will be added. Please contact us with any questions you might have. Hard Cover. Very Good+. 4to - over 9¾" - 12" tall. New Delhi, India: International Academy of Indian Culture, 1964. 1st volume published 196; next two volumes published 1974. Large volumes, published in original scripts and languagues, translated, annotated and critically evaluated. In clean, tight condtion. Heavy volumes requiring extra shipping for international shipments.. Green Gilt Lettered Cloth. Very Good Plus/No Dj. 4to - over 9¾" - 12" Tall. New Delhi, India: International Academy of Indian Culture, 1964. 1st volume published 1964, next two volumes published 1974. Large volumes, published in original scripts and languagues, translated, annotated and critically evaluated. In excellent condtion. Heavy volumes requiring extra shipping for international shipments.. Green Gilt Lettered Cloth. Near Fine. 4to - over 9¾" - 12" Tall.